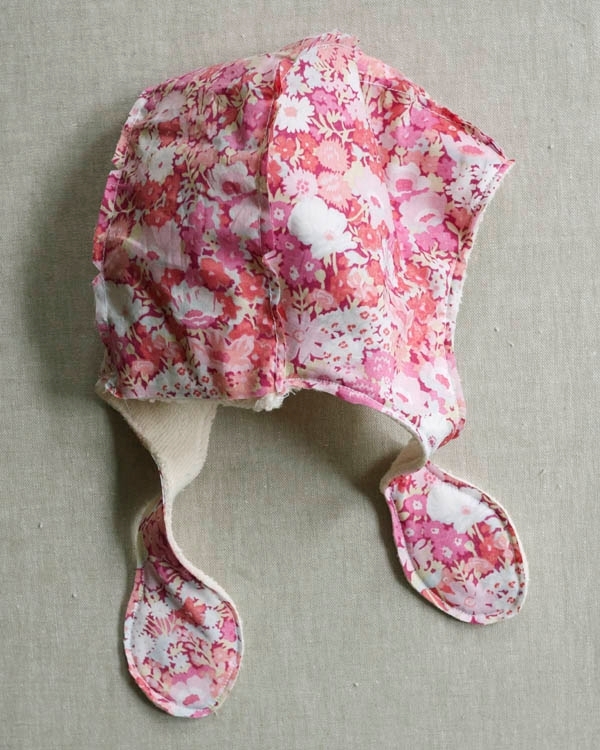 Nothing seems more quintessentially baby to me than a baby bonnet! 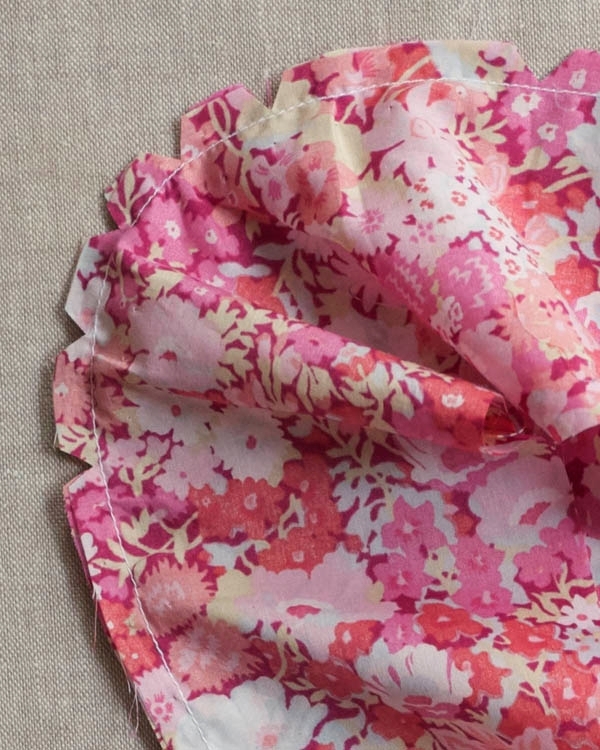 And no fabric seems better suited for one than Liberty of London’s gorgeous Tana Lawn. It’s just the right material for this classic garment: soft to the touch and in patterns sweet enough to rival even the cutest little baby face. But when you have a baby born in the height of winter, with snow falling and winds howling, however cute and charming it is, a delicate hat of just lightweight Lawn won’t do. And so, for the winter baby, I made a Winter Baby Bonnet. Michael Miller’s sumptuous Organic Sherpa adds an extra cozy layer and an extended tie doubles as a mini scarf. 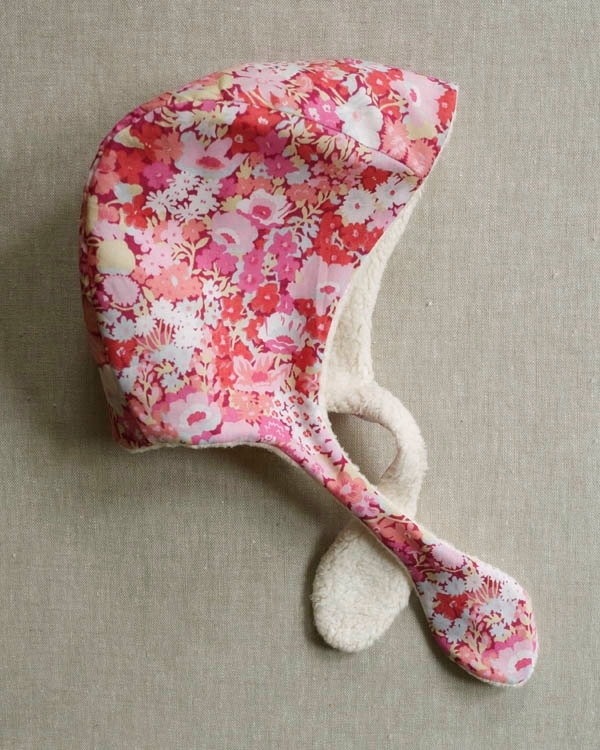 Decorative and functional, this Winter Baby Bonnet perfectly frames the baby’s face while keeping her sensitive head protected from the elements. Outer Hat: 1/2 yard of Liberty of London’s Tana Lawn. We used Hot Pink Wiltshire (above left) and Pink Thorpe (above right). A 110- yard spool of Gutermann’s 100% Cotton Thread. We used color 1040. 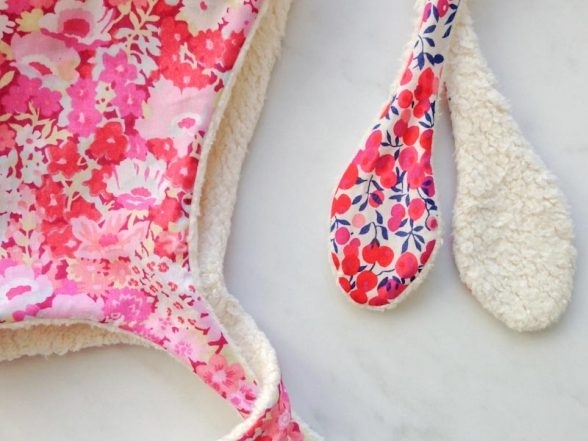 A Winter Baby Bonnet template, available for free download here, printed and cut out in the appropriate size. Sizes are shown for 0-3 (3-6, 6-12, 12-18, 18-24) months. The Liberty of London has two grain lines, one that runs parallel to the selvedge and one that runs perpendicular to the selvedge. Line up either one with the template. The Organic Sherpa only has one grain line, and it runs parallel to the selvedge and along the line of the knit. Line it up with the template, as shown above. 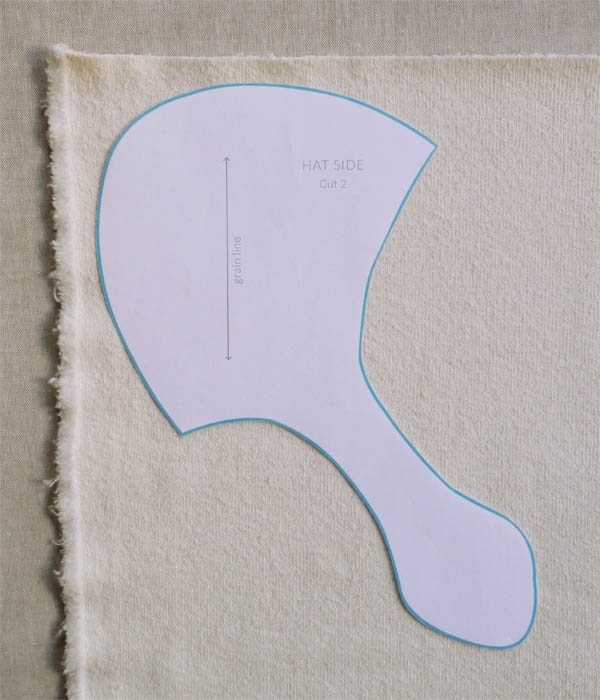 Also, to be sure that you cut the two Hat Sides from each fabric with the proper orientation, cut one Hat Side with the right side of the fabric facing up and one with the wrong side of the fabric facing up. The two Hat Sides from the same fabric should be mirror images of each other. 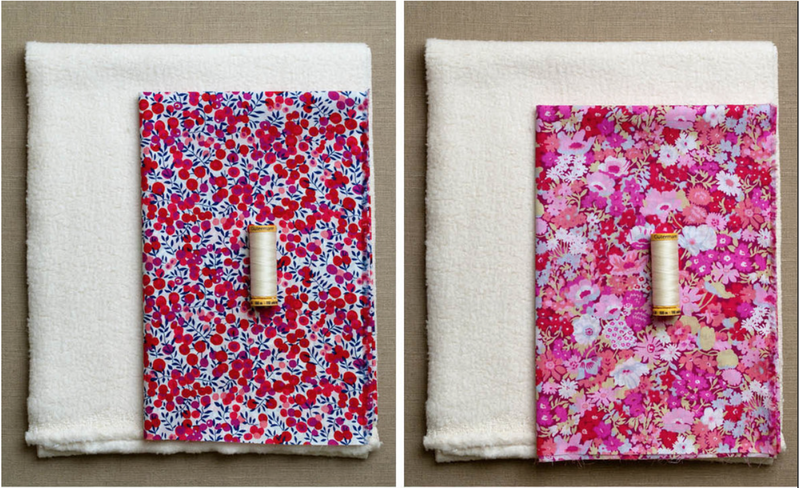 Cut one 3 ½ by 11 ½ (3 1/2 by 12 1/2, 3 3/4 by 13 1/2, 3 3/4 by 14 1/2, 4 by 15 1/2)-inch Rectangle from both the Liberty of London and the Organic Sherpa. The grain line of the Sherpa should run along the long edge of the Rectangle. Working with the Liberty of London pieces and with right sides facing, pin one long edge of the Rectangle to the long outside curve of one of the Hat Sides. 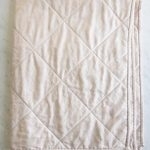 It can be tricky to keep curved seams wrinkle-free. Use a lot of pins to ensure that the seam will come out un-puckered and smooth. 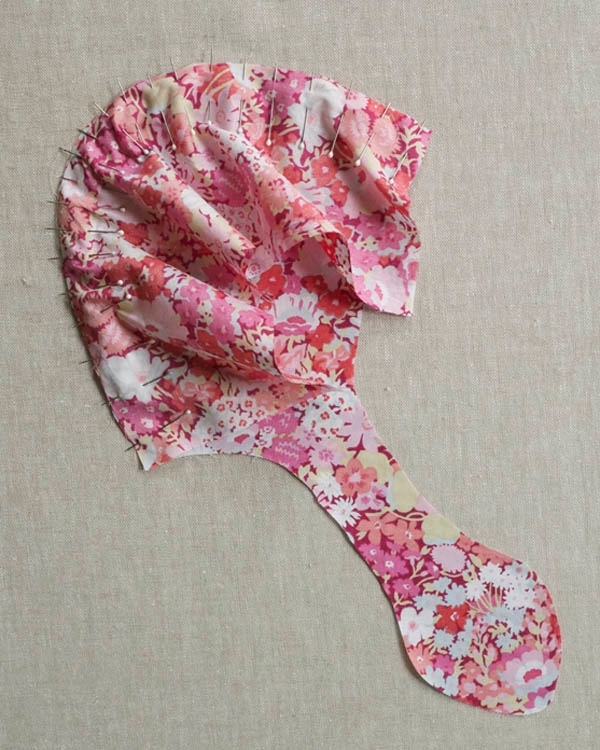 Sew around the pinned curve. Cut notches in the seam allowance along the curve. Trim the seam allowance to 1/8-inch. Repeat with the second side. This is the Outer Hat. Now, working with the Organic Sherpa and with right sides facing, pin one long edge of the Rectangle to the long outside curve of the Hat Side. The knit fabric is much more flexible around the curve than the Liberty of London, so you shouldn’t need as many pins to keep the seam flat. 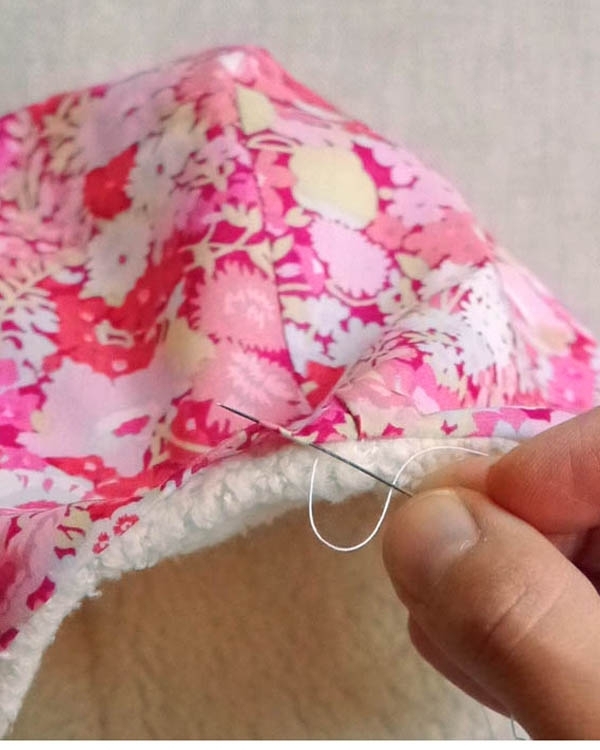 To sew, change the foot of your sewing machine to the walking foot and stitch along the pinned curve. Cut notches in the seam allowance along the curve. Finger press the seam open. Repeat with the second side. This is the Lining. 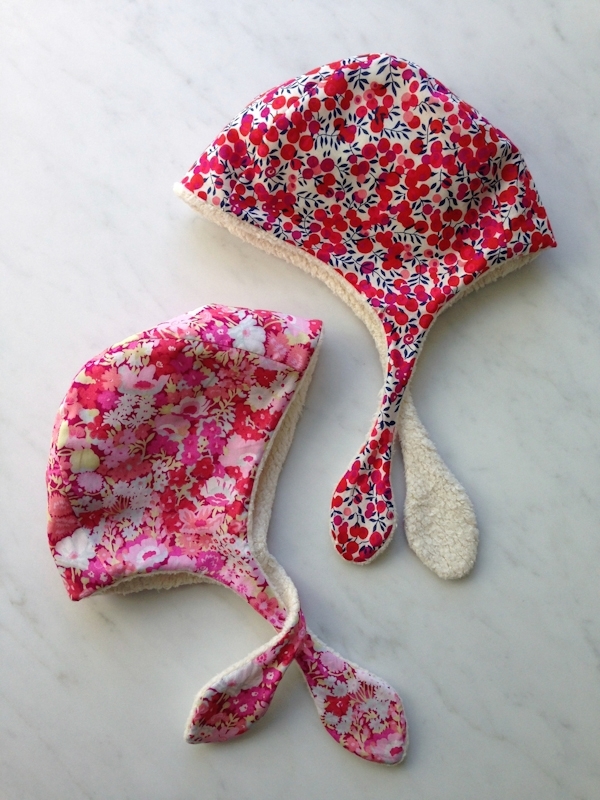 With right sides together, slide the Lining inside the Outer Hat. Pin the pieces together along all edges. 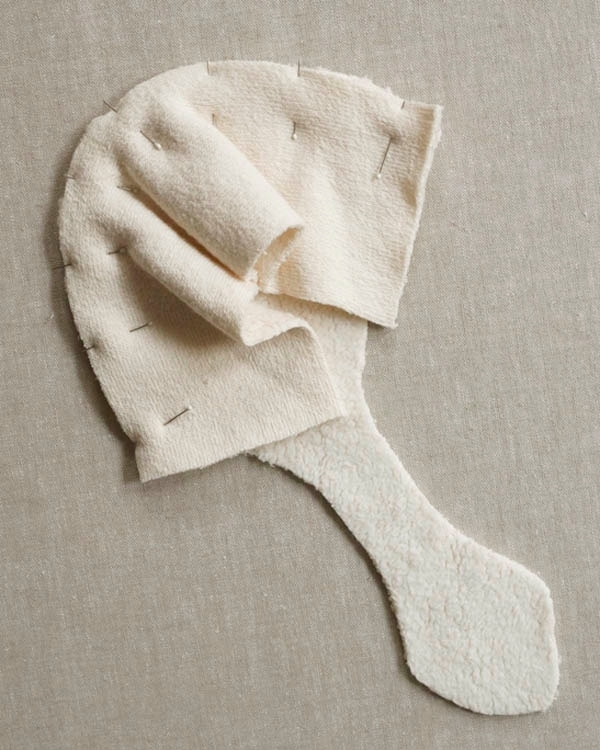 With the walking foot still attached to the machine, sew around the pinned edge, leaving the short end of the Rectangle at the nape of the neck open. Backstitch at the beginning and end of the seam. Pull the hat right side out through the unsewn gap. You may need to use a tool, such as a chopstick or the eraser-end of a pencil, to push the hanging ties through. 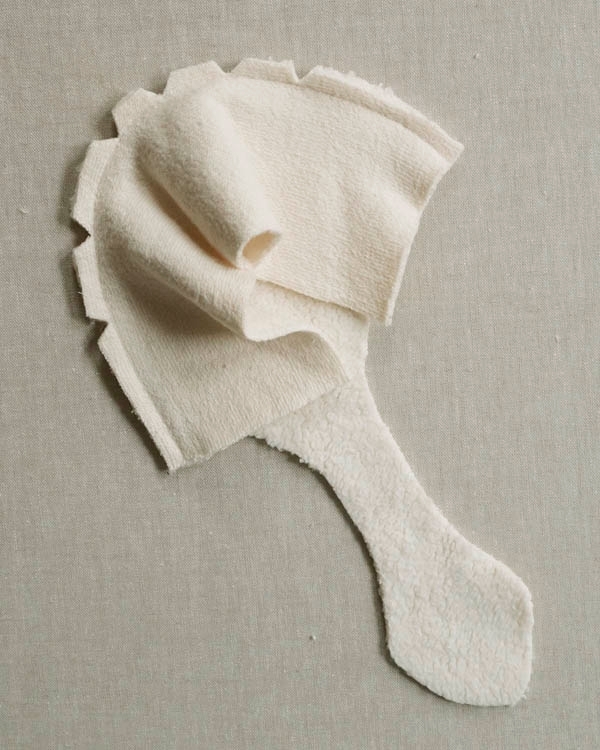 Thread a length of cotton thread onto a needle and use a ladder stitch to close the gap at the nape of the neck. 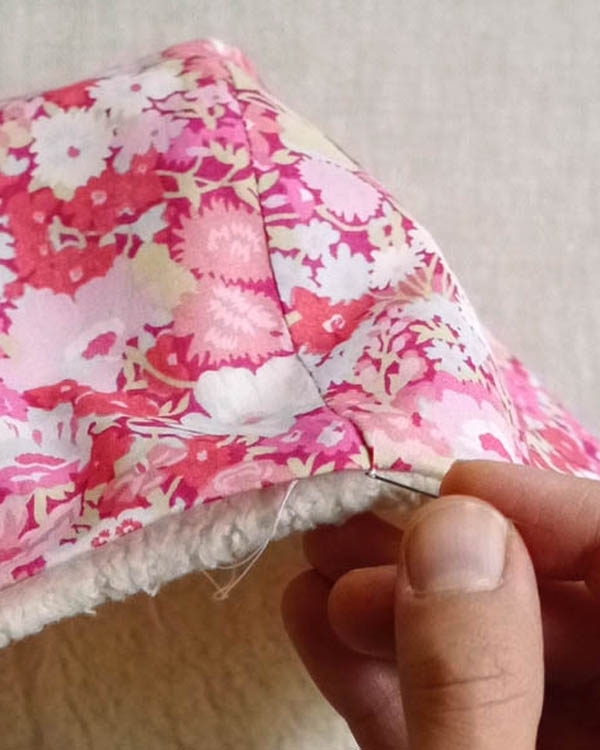 Here’s how: Fold the edges under so that they align with the adjacent seams. 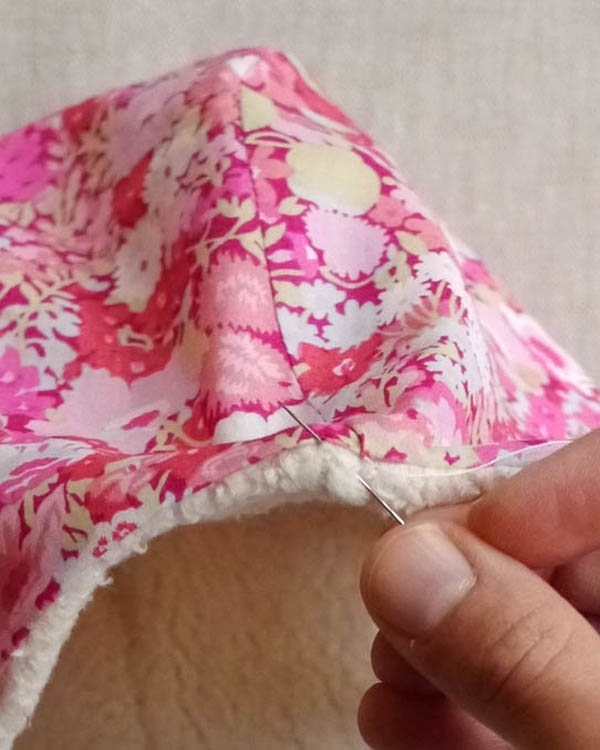 Pull the needle from the wrong side to the right side of the hem’s fold so that the thread’s knot is inside the hat. 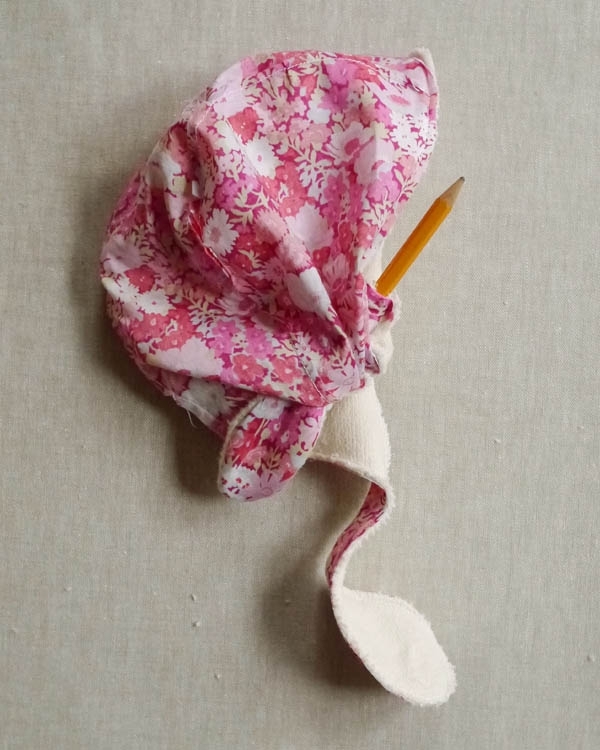 Insert the needle into the opposite fold, directly across from the exit point, picking up about ¼-inch of fabric. Pull the thread through the hat and snip it at the exit point to hide the end. I have been sewing almost 50 years now (gulp) and am a professional seamstress. So many of the tutorials I find on line make me crazy – not in a good way. Yours is so thorough (who else has photos of how to close an opening by hand??) and helpful and not silly. Wish there was a way that all new sewers could automatically be linked to this post. Thank you! You give me hope for the next generation of sewists. Absolutely darling!! Your site has never disappointed me when I search for ideas and projects to whip up as small gifts for new babies. Thank you ever so much for sharing! Thank you so much for your kind words! We appreciate your writing in! Bonnet original qui pourrait être offert à la naissance d’un bébé en octobre. Hi there, I love this pattern! But I can’t get it to print out correctly, the test square comes out 1/16th of an inch too small. I’m printing on A4, should it be something else? will it work anyway, if I don’t have it quite right? The easiest way to fix this would be to change your paper setting in your print settings. If your current setting is A4, you’ll want to choose US Legal. That way the pattern will print to scale. Thanks for writing in! Did this work? I’m running into the same issue. I’m getting ready to make this. I’m wondering if it stayed on ok or if I should plan on adding a snap to the straps? Thanks! Thanks for writing in! 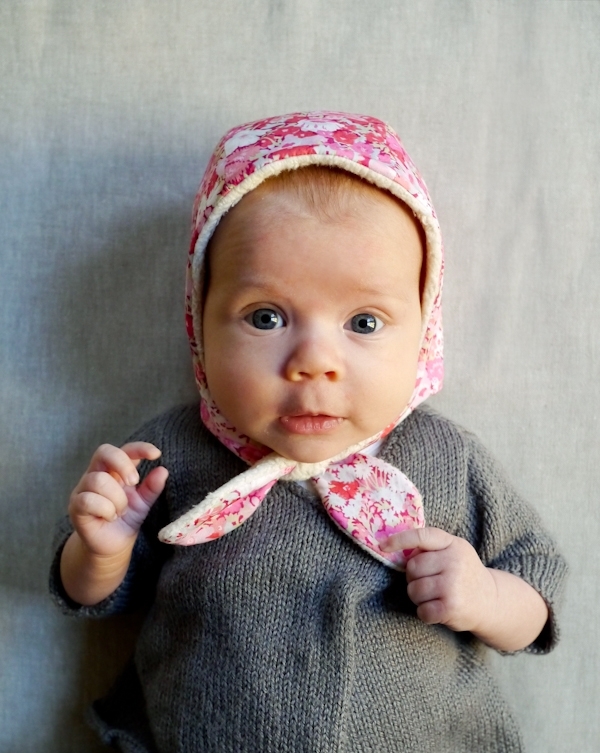 Of the babies that I have seen this sweet little bonnet on, the ties were sufficient to keep the bonnet on. You could always add a snap later if you find that the hat is coming off but I do believe that the tie works well! 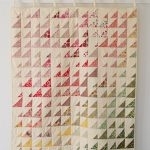 Thank so much I have only just found this, can’t wait to make it. I can only find minky fabric that looks similar at my local shop. Would this work for the lining? Minky fabric should work well as long as the pile is short enough! Do you think you could line this with knit thermal, or do you think that would change the hat too much? I am thinking of making it for some babies with big noggins, and I know knit thermal can stretch a bit. Thanks for your question! 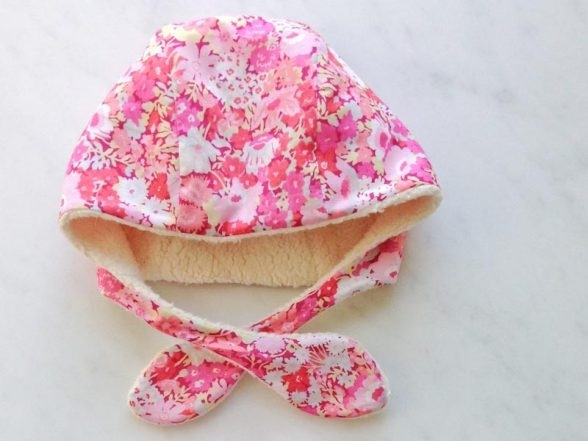 I think the beauty of this bonnet is that organic sherpa is a lightweight but still sturdy fabric with a bit of stretch. I would recommend that if you substitute this fabric you use something on the thick side so the bonnet doesn’t become too floppy. Thanks for writing in! 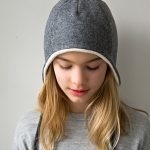 For this hat we used a thin/fine cotton for the outside and a thicker, fleece-type fabric for the inside. So long as you use similar weight fabric, the bonnet should fit as expected. As to altering the shape, that might be bit more complicated. 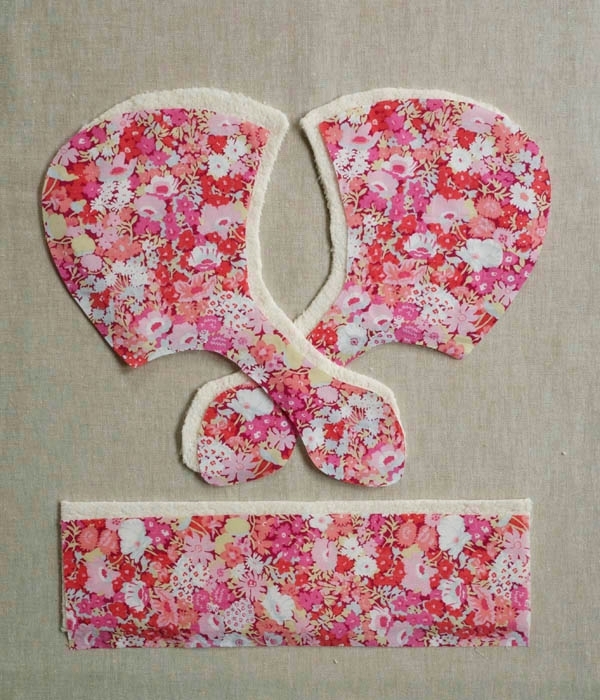 The template is designed to cover the ears so it is not as simple as rounding off just before the ties. You may be able to round off at the thinnest section of the tie and add ribbons at that point. 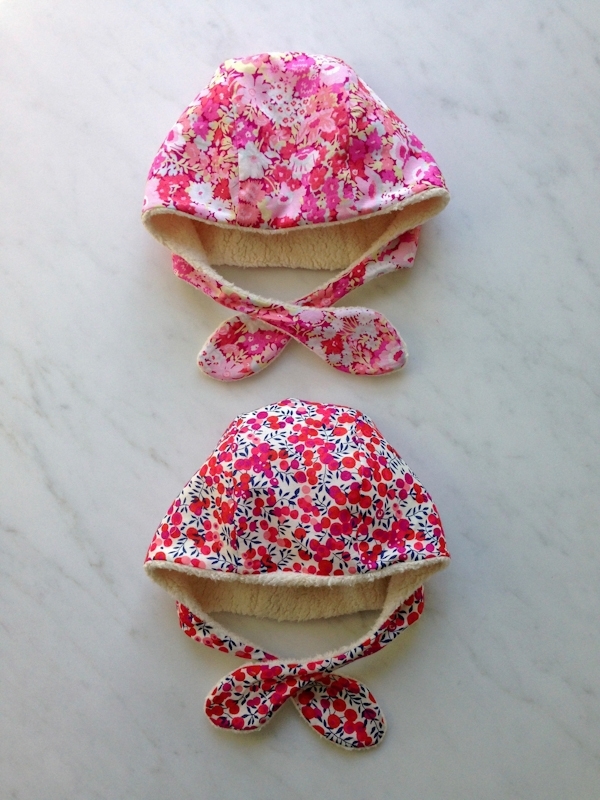 We do have a bonnet pattern that does have thin straps that may work for you as well; the Baby Sunbonnet! 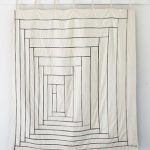 Hi – I am hoping to make this for my 3-year old. Do you have any advice for sizing it up a little? Her head is about 48.5 cm circumference. Thank you! Thanks for reaching out! 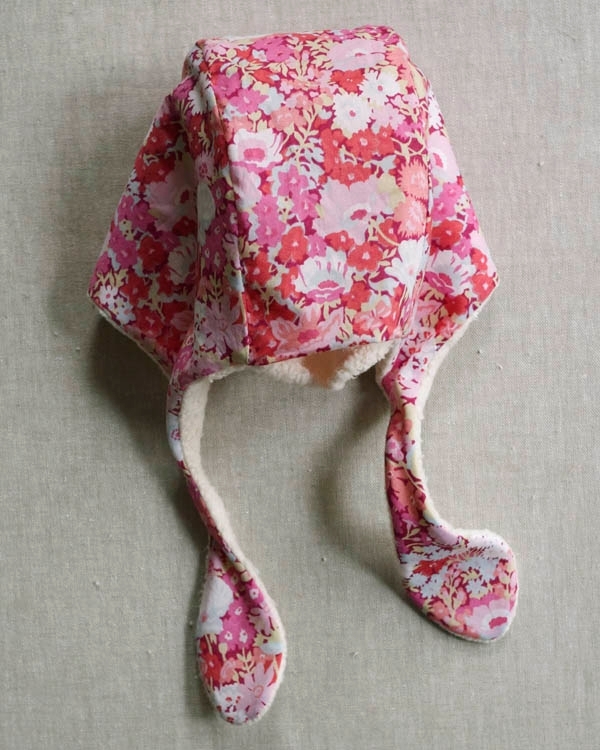 At present, this sweet little bonnet is available in just the size listed above. 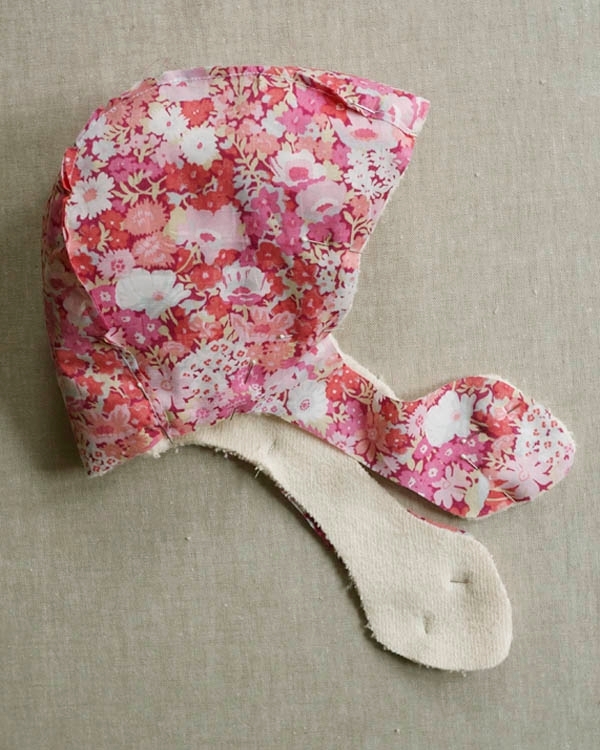 Our Lamb Bonnet goes a bit bigger in size and the largest size fits a head of 19 inches or 48.26 cm. By omitting the ears, you could get quite a similar look! Do you have the pattern for the knit sweater the baby is wearing? Thank you! ** love the bonnet too! Made this for my granddaughter, it’s adorable and was much easier to make than I expected. Thank you! I was just about to start this and am unsure if the seam allowance in in the pattern or if I need to cut the fabric bigger? Thanks for reaching out! Seam allowances are included in all of our templates and patterns, so you can cut the pattern pieces to the exact same size as the templates.